The first office of The San Diego Union newspaper, Old Town, San Diego. The first issue was published on 10 October 1868. The building was constructed in Maine and shipped by sea to California in 1851. It later became the first office of the San Diego Union. The building is still in Old Town and visitors can view the original print room. Gatewood did not remain a publisher long, selling out to Charles P. Taggart in 1869. He continued his law practice in San Diego with his office located at the downtown Horton Bank Block at 3d and D Streets. His obituary noted that "he was a brilliant speaker, and as a lawyer he ranked with the best. "5 In 1871 Jeff and Mary celebrated their fourteenth wedding anniversary in Old Town at the home of Mary's brother, Undersheriff Crosthwaite.6 In the 1880 census Jeff was 50 and his wife, Mary, was 47. They had no children. They lived in Old Town for many years, later moving to "New Town" - downtown San Diego. Mary died in 1881 and Jeff died in 1888. The San Diego Union obituary noted that he was aboard his schooner, "Rosita," when he died from heart problems. The Daily Bee reported his death aboard the yacht "Queen" at the foot of F Street. Mary and Jeff Gatewood were buried in the Mt. Hope Cemetery in San Diego in unmarked graves not far from the spire marking the burial of Alonzo E. Horton, called by many the father of San Diego.7 Jeff Gatewood is remembered in the town of San Andreas with a street named after him - Gatewood Avenue. The small lane goes westward off of Highway 49 and is near the cemetery. The photo of William Jefferson Gatewood, above, is from the San Diego Police Historical Association webpage and has no source documentation: http://www.sdpolicemuseum.com/Jeff-Gatewood.html. The photo of the historical building in Old Town comes from Wikimedia Commons website and was taken by Joe Mabel. See more information on the San Diego Union Building on the California Department of Parks and Recreation webpage for Old Town San Diego. "Gatewood was Private in War with Mexico," newspaper article by Joe Stone. No date nor name of newspaper. From the Gatewood File, San Diego History Center, Research Library, Balboa Park, San Diego, California. The article was probably in the San Diego Union. Letter from J.A. Smith in San Andreas, CA, to Francis P. Farquhar in San Francisco, 3 May 1937. Gatewood File, San Diego History Center, Research Library, Balboa Park, San Diego, California. "A Fatal Duel at San Andreas," Newspaper article, San Andreas Independent, San Andreas, Calaveras County, California, Saturday, 17 Sept 1859. Accessed at Newspaper Abstracts, http://www.newspaperabstracts.com/link.php?id=28306. Goodwyn challenged Gatewood on Thursday night and the duel took place early Friday morning. Goodwyn is also referred to as Dr. P. Goodwin, Preston Goodwin or Goodwyn and Dr. Gooding. His name, Dr. Peterson Goodwyn, can be found in Students of the University of Virginia: A Semi-centennial Catalogue with Brief Biographical Sketches. Charles Harvey & Company, 1878, accessed June 2015 at the archive.org website. "Early Journalism in San Diego: The San Diego Herald and The San Diego Union," by Teri Thorpe, The Journal of San Diego History, San Diego Historical Society Quarterly, Summer 1982, Vol. 28, no. 3. Accessed online at the San Diego History Center website, www.sandiegohistory.org. 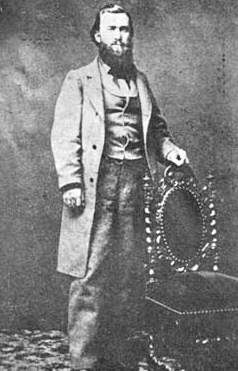 "Chief Edward W. Bushyhead," Biographical sketch of Edward. W. Bushyhead, co-founder, with Jeff Gatewood, of the San Diego Union, and later Police Chief in San Diego. San Diego Police Museum website, http://www.sdpolicemuseum.com/Bushyhead.html. "Colonel Gatewood Dead," Obituary of William Jefferson Gatewood, San Diego Union, Tuesday, 27 March 1888, p.5, col. 4. "Wife Died in 1881," Newspaper clipping, undated, name of newspaper not noted. Gatewood File, San Diego History Center, Research Library, Balboa Park, San Diego, California. Mt. 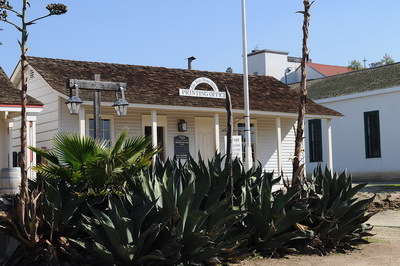 Hope Cemetery Office in San Diego confirmed, 21 July 2015, that the Gatewoods are buried in the cemetery, Division 3, Section 9, Lot 27, Mary in grave 1 and Jeff in grave 2.